Sometimes life comes always different from than you plan it. It was due to an event at The Dolder Grand why I was travelling within Switzerland that weekend. 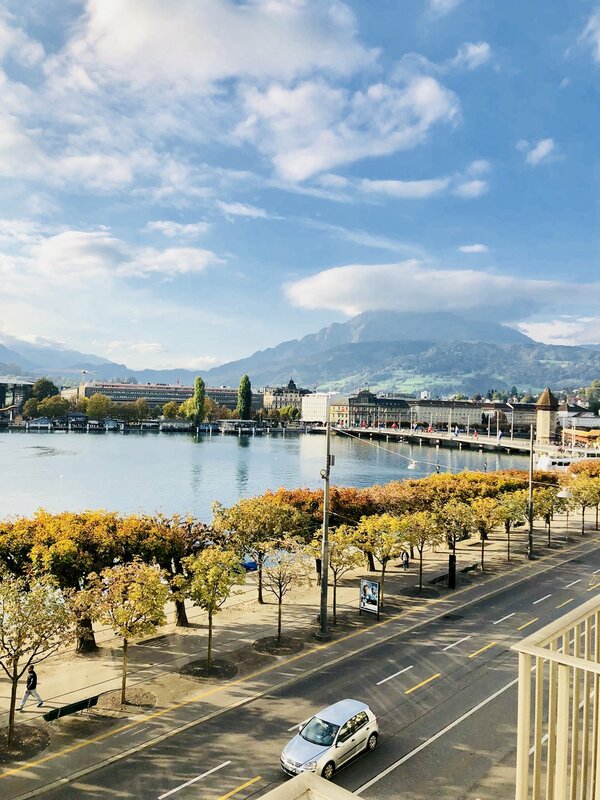 Having seen Zurich already quite a few times, I decided to add a night in the city of Lucerne, an actual favourite of mine in Switzerland as it is more laid back and has some of the most amazing views in the world. If you are staying in one of the Grand Hotels on the lakeside, you should without doubts go for a lakeside room because I cannot imagine any better way to waking up than to a lovely view of a picture perfect landscape including a blue lake and the snow-capped mountains making the back of the picture-like view. Luckily Lucerne isn’t short in luxury hotels and since I was staying for one night only, I wasn’t in need for a wide variety of facilities (so Bürgenstock and Park Hotel Vitznau were not an option this time) plus my main focus was to stroll around town and maybe take a boat ride before heading towards Interlaken. Why did my plans change? Well I somehow lost the feeling for time and ended up having dinner with friends in Zurich. Not the best decision when it comes to my wallet (having paid nearly 100 USD for a glass of wine and one main dish) and definitely not smart considering what was waiting for me in Lucerne. As luck would have it, Lucerne was only a 40 minutes ride away from the restaurant in Zurich and I soon drove up in front of the legendary Schweizerhof in Lucerne. I was totally impressed when an array of staff was still here at 11pm just to welcome me to my “home away from home” as they prefer to call their hotel. I know the industry quite well and I know it is absolutely not usual to have two bellmen at that time, not even talking about valet parking or luggage service. They took care of everything and after an express check-in, I was accompanied to my upgraded Lifestyle Junior Suite. Never ever would I have expected to receive such a top service during the night. Both front desk attendants were really friendly and went beyond their duties by taking the time to explain everything and do a tour as you would normally receive it at daytimes. First of all, the hotel is a lot bigger than it looks like from outside and I have to admit that the hotel seemed like a real labyrinth. One elevator ride, walking through a corridor, then another elevator and then another hallway until I reached my room at the end of the hallway. My Junior Suite - a corner room by another name – was very spacious and while I personally would not address it a Junior Suite, it was definitely bigger than the Deluxe rooms next to it. 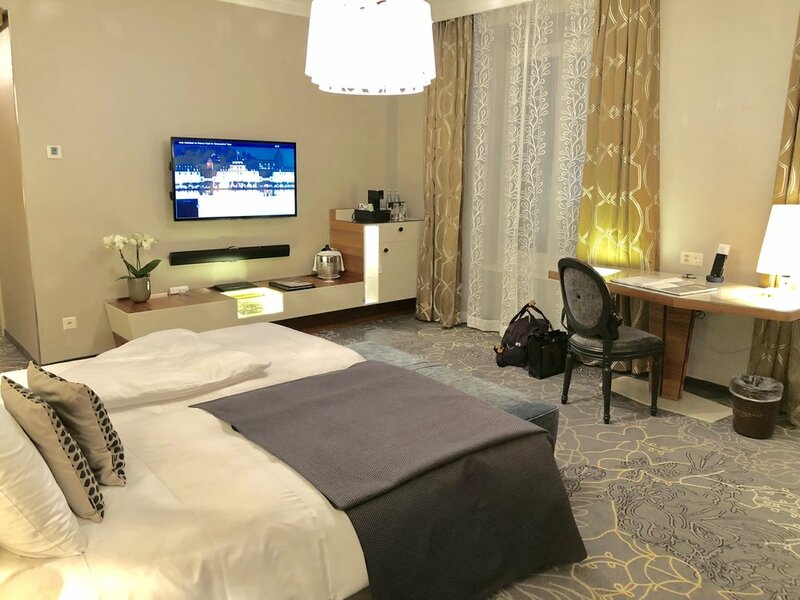 Generally, the room felt really comfy and the interior design was typical for a Swiss luxury hotel that has recently gone under a refurbishment. Next to the entrance was a wardrobe with plenty of light and storage space while on the other side I found the bathroom with marble floor, double sinks, toilet, bath tub and walk-in shower. I really appreciated the separate shower with good pressure and I was happy to see Molton Brown’s new range of toiletries. Housekeeping was really good and the entire room was flawlessly clean. In the main bedroom I was surprised with a freshly baked cake and handwritten welcome letter along a bottle of hotel-branded Prosecco as a warm welcome. Inside the main room there was a sideboard with the television, a historical piece (all rooms are dedicated to a different celebrity guest that once stayed at the hotel) and minibar as well as illy coffee machine (with capsules refilled daily and upon guest’s preference), a writing desk with a chair, two armchairs next to the balcony with chair as well as a perfectly sized double bed made out of two single mattresses. Each bed had a single blanket and two pillows ensuring a good night’s sleep. While I was totally overwhelmed by that stunning view of the lake and mountains the next morning, one could still hear some passing cars during the night. Unfortunately, the windows in my room where not perfectly sound proofed, however I managed to fall asleep as usual and it wasn’t a big hassle. Anyways if you really have problems falling asleep, you might better go for a room overlooking the city or choose a room on the higher floors, where you might not hear anything. After a good sleep, I went down to the main restaurant of the hotel and was confronted with the historic past of the hotel. Already the room in which the bar was located did impress me a bit with these high ceilings and stucco. When I continued, I was friendly welcomed by a restaurant staff member and shown to a nice table overlooking the lake. Service was really friendly and they offered me to order any egg dish along a hot drink. The rest of the breakfast is set up on a massive buffet in the main restaurant room which I would describe as a small ballroom. 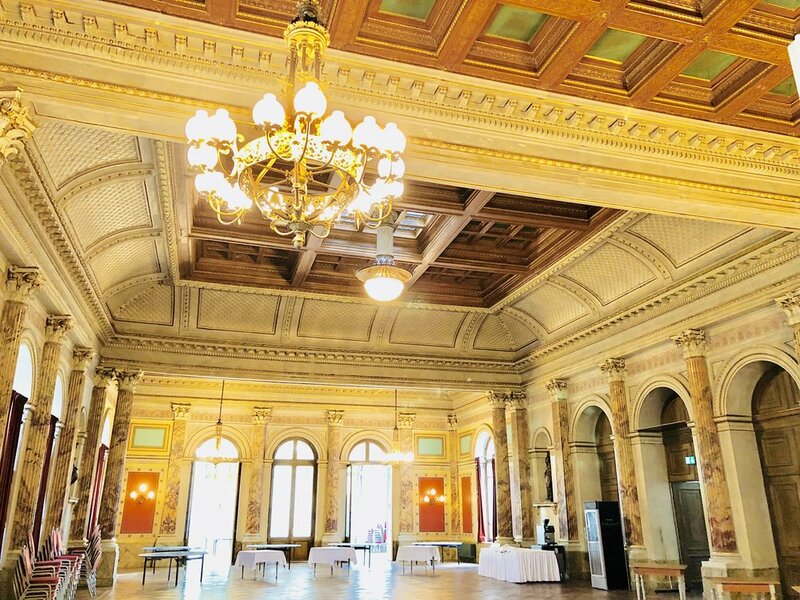 Within a really pretty room, they showcase anything you expect from a Swiss breakfast, from fresh cheese and dried meat to a huge bread and jam selection onto yoghurts and juices as well as salmon and clear soup. Since I still felt a bit sick, I was loving the clear soup and the tea along my freshly prepared omelette. Truth is, once I was in Interlaken I didn’t have any more space for lunch and skipped this one for a coffee in Grindelwald overlooking the massive North Face of the Eiger. All in all, the Schweizerhof in Lucerne is one of the best places to stay in Lucerne and comes definitely up the good reputation. They also have a small spa on the top floor, however since it was already reserved, I was unable to enjoy it on the next morning. Their gym consists of the latest state-of-the-art TechnoGym equipment and is therefore perfect for a workout when in Lucerne. 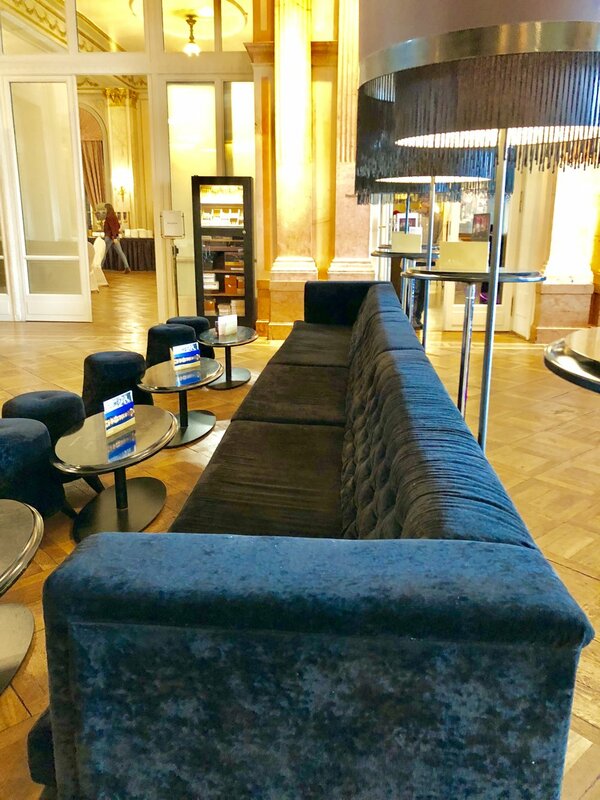 I really enjoyed the one-night stay and would like to highlight the hotel’s location and views plus especially the staff which is the key factor for staying at the Schweizerhof. I was guest of the Hotel Schweizerhof Lucerne, however all above written expresses my own opinion and has not been influenced.